4th year Pic 297 - Jan - 18 2013. Chanawalla - Mumbai Critiques welcome! BEST VIEWED in large size. 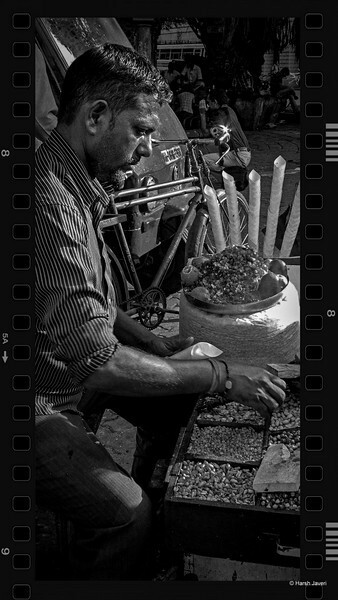 A chanawalla sells different types of chickpeas and peanuts and can be found on many roadsides through out India. They can be bought separately, mixed and plain, or mixed with onions, lemon juice, salt & red chilly powder! Neat street scene....dig the filmstrip sides too! HI, this is a great portrait. Great black and white tones as well as your capture. Frame is very nice. wow The light here is wonderful! Terrific environmental portrait! That food sounds really good!